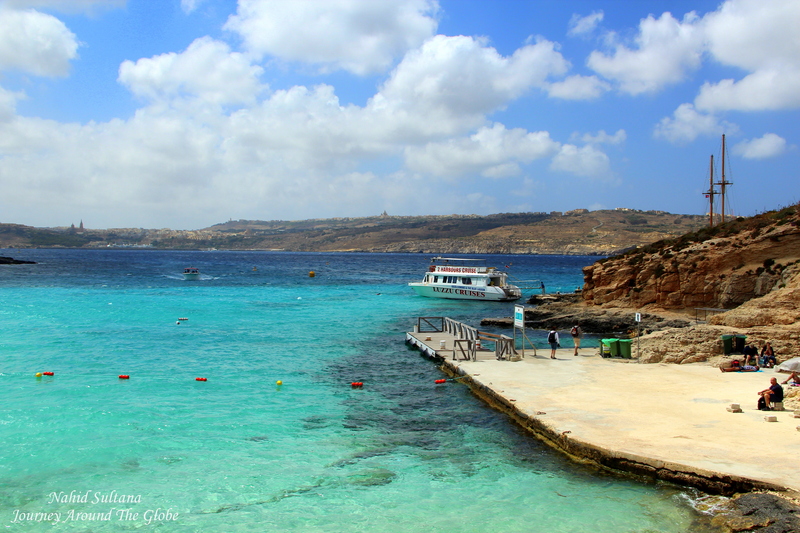 ISLANDS of GOZO and COMINO, MALTA: Islands of Gozo and Comino are two sister islands of Malta. 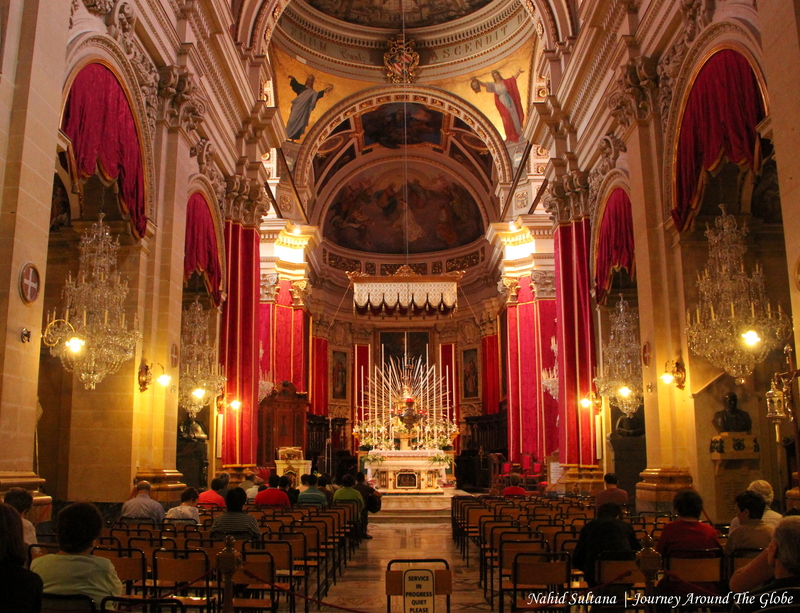 Both of their culture and history go back hand in hand with Malta. Both of these islands are famous for their unspoiled beaches, diving sites, pre-historic landmarks, and shimmering scenic beauty. No one should leave Malta without taking trip to Gozo and Comino…this is where the adventure lies of this island nation. We took this trip on our second day in Malta. It was 30 euros per adult and 20 euros for kids over 5. We met up near Sliema Ferry Service (it’s not the same service) in one of Luzzu Cruises’ kiosks and set off at 10 am. Our first destination was hour and half journey to the north to Island of Gozo. After reaching Gozo’s main harbor, Mgarr Harbor, they took all the tourists (except us, since we were all feeling sick from the bumpy ride on the sea) in small vans for a 3 hours sightseeing tour. 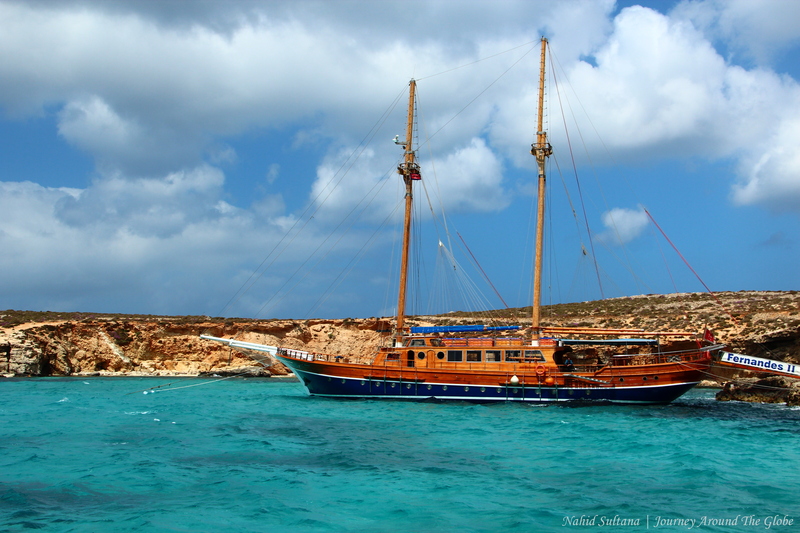 Then came back to the dockyard and went for another 5 minutes cruise to Blue Lagoon in Comino. We had about little more than hour to swim or hang out in Comino. 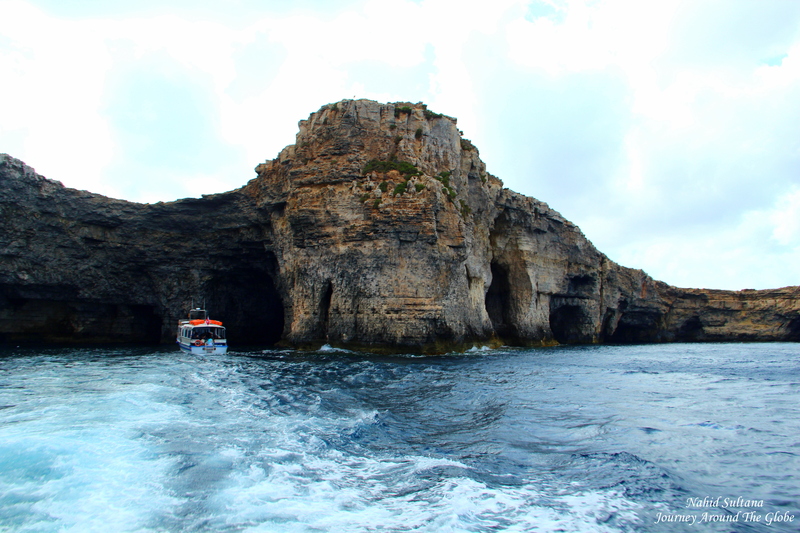 At 4 pm we started cruising back to Sliema stopping by the Caves of St. Mary’s for few minutes. It was around 5:30 pm when we arrived back to where we started from in Sliema. This boat only departs every Monday, Wednesday, and Friday from June to October. Good part of this deal was that you can take a free hour and half harbor boat tour the following day with the same ticket. We had to pass that trip, we wanted to go back to Valletta for our last couple hours in Malta. There are also some night harbor cruises or fishing trips. Travelers can email leo_kir@hotmail.com for any service with Luzzu Cruises. TIME of TRAVEL: It was beginning of June 2013 when we flew to Malta. It was a lovely day to take such tours, but our captain warned my husband that the sea was going to be rough that day and since we were traveling with kids, we should be careful. I was scared at first, but he explained there is no danger going to the sea, but the ride will be VERY bumpy. We decided to go anyway thinking “how bad can it be”. Oh man, after 10 minutes of that up and down ride my 7 year old literally threw up on my pants. It felt like someone was shaking that whole vessel and was throwing it into the sea without any mercy. Then I started puking, my little one started crying, and my husband feeling helpless. I don’t remember how many times my eldest daughter and I threw up (sorry if I am making you disgusted)…but after a while we both were tired and fell asleep. 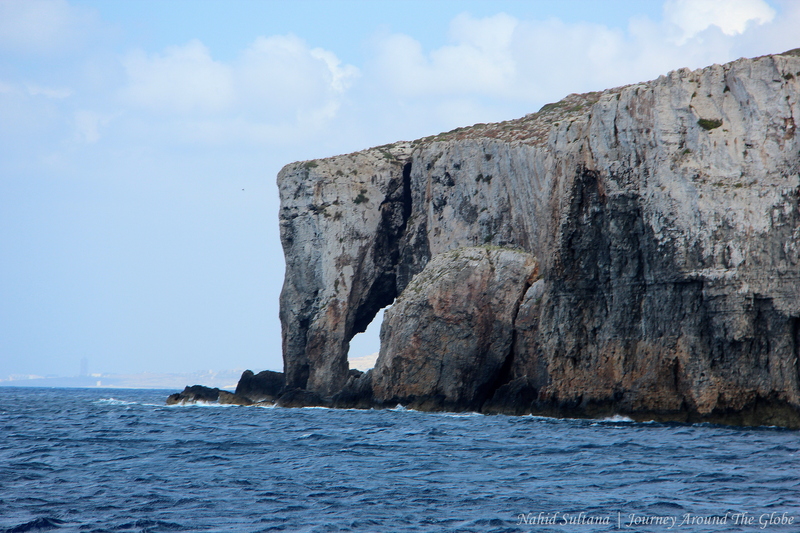 Then as soon as we got off shore, we decided not to go with the sightseeing van in Gozo. We freshened up, washed our clothes, hired a taxi, and went around Gozo with my wet pants on. It was one hell of a ride…phew, if we only knew what the captain was talking about. OUR HOTEL: We stayed in Hotel Plevna in Sliema, another city in Malta. The best part of this hotel were the location and its view. We could see the Mediterranean Sea from our balcony both on the right and left side. I actually managed to get up one morning during sunrise at 5:30 am and walk to Sliema promenade to take some shots and enjoy the morning sun. The hotel itself was pretty awesome too, had free breakfast included in the price. The only thing we wished was Wi-Fi in our room, lobby had free connection. The hotel also had free beach club for its guests by Sliema Promenade. We used to walk only 5 minutes to the ferry terminal to go to Valletta. All the nice restaurants (along with McDonald’s and Burger King) are also very close-by with a nice sea-view. If I ever go back to Malta, I will stay in Hotel Plevna again for its nice staffs and great location. EATING and SHOPPING: We really didn’t have lunch that day since we were all feeling yucky and sick and wasn’t in the mood for heavy lunch. The girls and we had some Snicker bars and Pringles with some juices. But I think the others in the group who went on the jeep tour were given time for lunch/snacks. PLACES WE’VE VISITED: In total, we had about 4 hours for Gozo and Comino (not counting the ride). 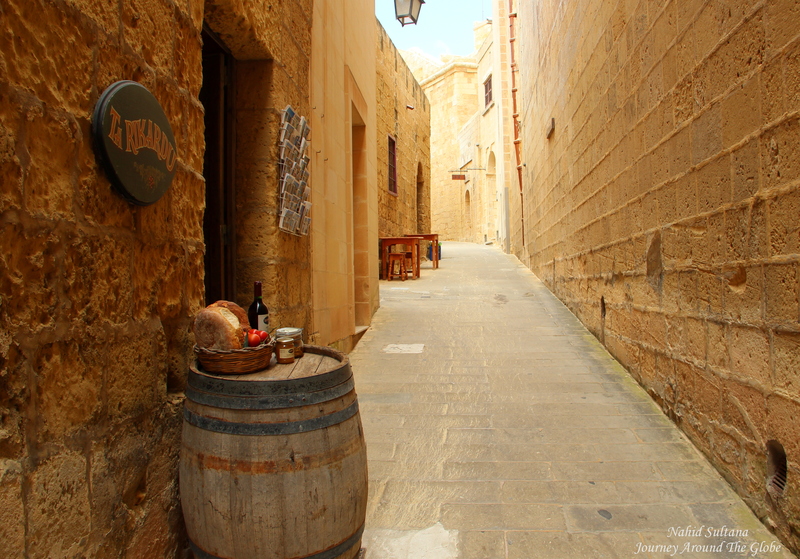 Gozo definitely has more things to do and see than Comino. We couldn’t see the Azure Window of Gozo, a beautiful rock on the Mediterranean, along with some other beaches and ancient landmarks here. 1) ISLAND of GOZO: Gozo, one of the three islands of Malta, is a popular destination for diving and other beach/water activities. It’s smaller than Malta and less modern and more remote. There are many scenic fishing villages, green landscape, and fine beaches in this island. Azure Window is one of the most popular sites of Gozo. We haven’t been to any of these spots, because of our sickness from the sea. 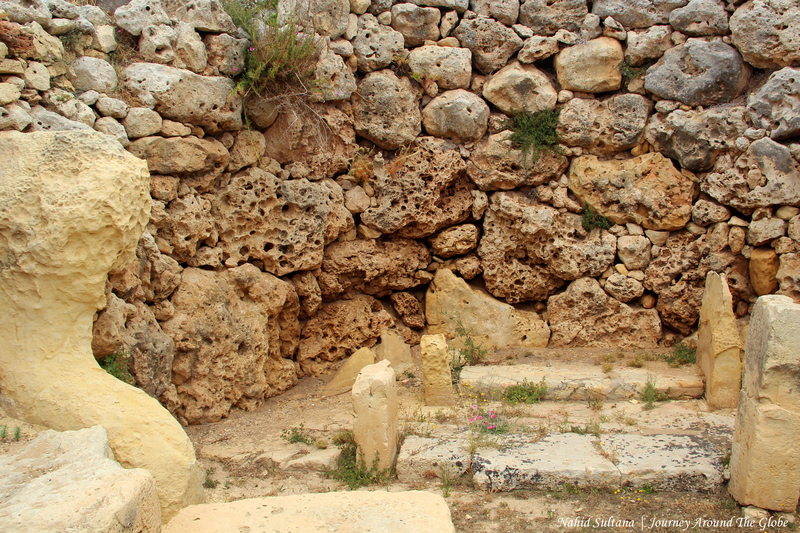 Other than natural beauty, Gozo is officially home of the oldest structure on the planet…Ggantija Temples. Gozitans (they get annoyed if you call them Maltese) speak similar language like Maltese but in different dialect and speak very good English. We had about 2 hours in Gozo after freshening up. Since we didn’t go with our sightseeing bus, we hired a taxi for 40 euros to takes us around the island. We managed to visit the following four spots. The taxi was supposed to take us to a nearby fishing village too, but we had to get back to the dock to catch our boat to Comino. a) CHURCH of OUR LADY in LORETO: It’s a very beautiful big white church in the village of Ghajnsielem. It was our first stop and a quick one. There is no fee to enter. b) THE GGANTIJA TEMPLES: The Ggantija Temples, “Place of giants”, are thought to be the oldest free-standing structures in the world. The temples were the first of the Maltese prehistoric monuments to be cleared of the accumulation of earth and debris. The megalithic complex of Ggantija was erected in three stages over a period of several hundred years (3600 – 3000 BC) by farmers and herders of Gozo at the center of the Mediterranean. This complex stayed in used for some 1000 years until Maltese Temple Culture disappeared abruptly and mysteriously. Later around 2500 – 1500 BC the site was adopted by the inhabitants as a cremation cemetery. They say, these temples are 1000 years older than the pyramids in Egypt, making it a UNESCO World Heritage Site. Presently it’s only the ruins we saw but definitely are among the best-preserved temples on the Maltese islands. Visiting the temple didn’t take us more than half an hour. Entry fee is 5 euros per adults and 2.50 euros for children 6 -11 years of age. The temple is open Monday thru Sunday from 9 to 5 pm (last admission at 4:30) and closed on public holidays. Ticket to Ggantija Temples also allows visitors to see Ta’Kola Windmill. 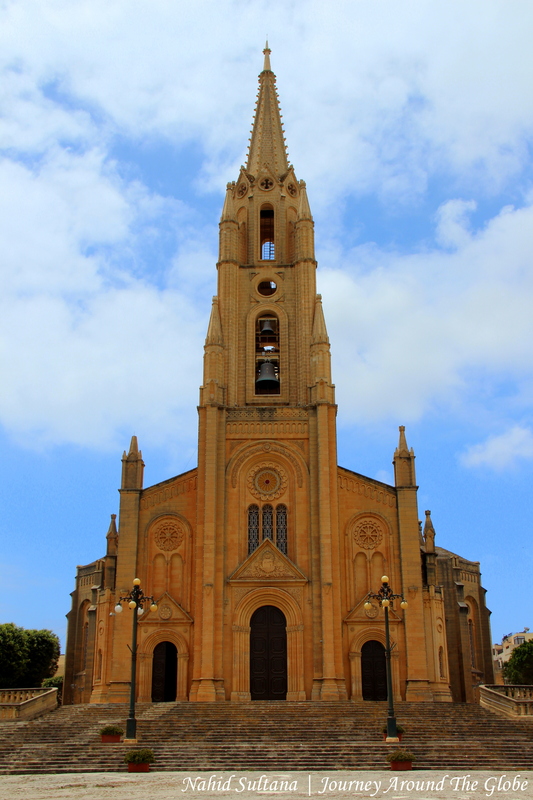 c) GOZO CATHEDRAL: Also known as Citadel Cathedral, this is a beautiful Baroque cathedral from the early 17th century. It’s small but very graceful. Check out its mosaic marble floor with tombstones and painted ceiling…they are remarkable. There is no fee to enter, but definitely worth a visit. It’s located at the same site as Gozo Citadel. 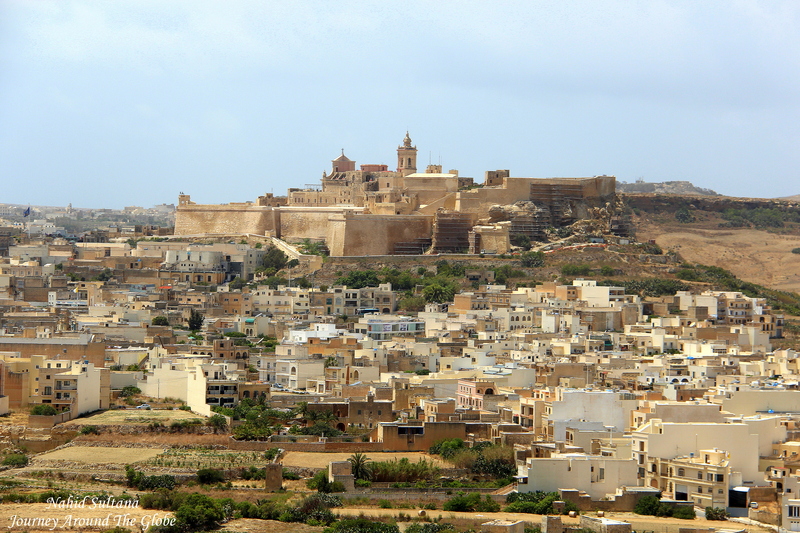 d) GOZO CITADEL: Located in Rabat (also known as Victoria), capital of Gozo. The setting had very middle-age touch and looked like it was built with sandstones. This island’s fortress was built somewhere around the 15th century and was never conquered by anyone. It rises steeply above the surrounding countryside offering a superb view of the island. It’s free to enter the citadel’s courtyard. But the museums and exhibitions have entry fees. We just walked along the old walls of citadel and then top of the hill for a nice view over the village. We only had about half an hour or so to just get a glimpse of the citadel before catching our taxi to the boat terminal. 2) ISLAND of COMINO: Island of Comino is the least developed among all the three Maltese islands. The island is known for its tranquility and remoteness. The lagoon with its shimmering aquamarine water, this makes an ideal choice for most kind of water sports, especially snorkeling and diving. There are no roads or streets in this small place. Our taxi driver in Gozo was saying only 6 people live here now and there is only one hotel, a 5-star, and a police station in Comino. It’s all natural beauty everywhere we looked. 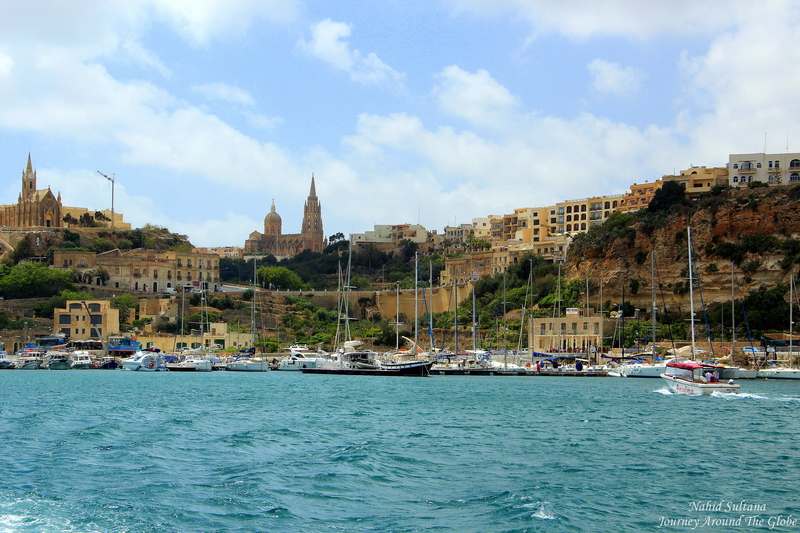 Gozo can be seen from here, as it’s only 5 minutes boat ride between these two islands. 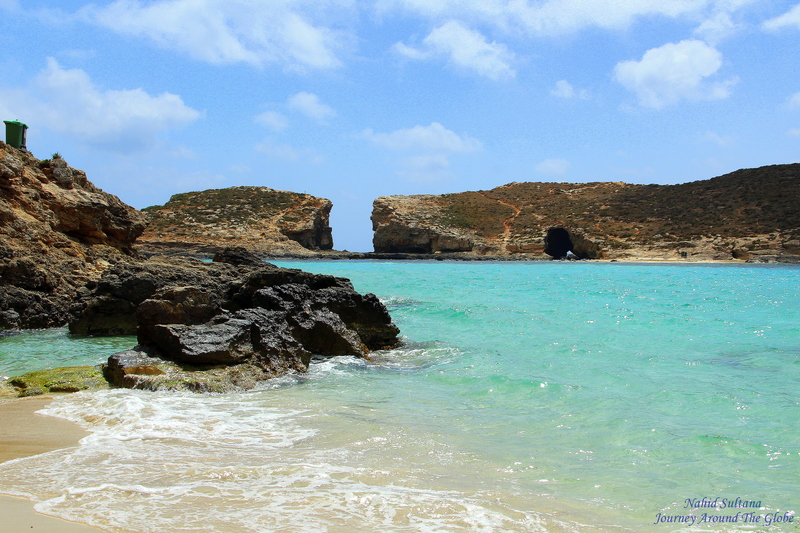 a) BLUE LAGOON: This is the main attraction of tiny island of Comino and popular for day trips. Blue Lagoon is famous for its stunning azure-blue water. Tourists come here for swimming, sunbathing, or snorkeling. The scenic beauty is beyond words can explain. Small but picturesque white sandy beach surrounded by turquoise blue water and big rocks in the distance can make everlasting impression on everyone’s mind. We stayed here about an hour. While some of our group members took a dip in the water, our daughters and I soaked our feet in the transparent water, took some pictures, and went on exploring Comino on foot. There is a tower, Santa Maria’s Tower, which we couldn’t find…other than that there isn’t much to do if you are not into water sports. b) CRYSTAL CAVES of COMINO: Crystal Caves are located at the north coast of Comino and only few minutes boat ride from Blue Lagoon. The boat took us near a large cliff and beneath are these caves. Caves were dark, couldn’t really see anything inside…gives you a creepy feeling. Don’t forget to look for a rock formation that looks like elephant’s trunk near Crystal Cave. After the caves, it was end of our Gozo & Comino trip. It wasn’t that bad on our way back to Sliema because the wind was going on our direction. All four of us took a nice nap in the boat and before we knew we were back to our familiar spot. If I knew the ride was going to that crazy, I probably would have canceled the trip; but at the same time, that god we actually went on, otherwise would have missed the real beauty of Mediterranean and real pearls of Malta.